Kenya's Coast is quite beautiful and pleasing, as I have described in a previous post. The coast makes it a great area for business retreats, especially if you are having them at the South Coast, away from Mombasa. It's the ultimate business and pleasure combination. Getting to the coast can be in several ways, overnight bus to the coast, a 5 to 6 hour bus ride, or better yet a 40 minute flight. The flight is quite cost effective , and best of you all, enables you to fly in just in time for your business and fly out early enough to catch up with business for the following day. 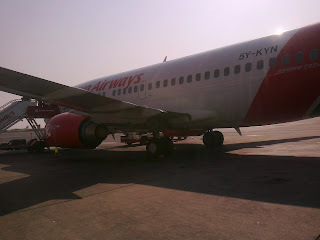 This week saw me jetting down to the coast for 2 days on a Kenya Airways flight. 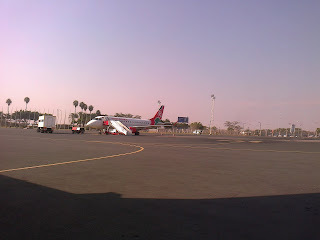 Kenya Airways operate in the old busy Jomo Kenyatta International Airport. The Airport is currently seeing the construction of a fourth terminal as passengers numbers have outstripped it's capacity. The airport is expected to handle more traffic as more institutions set up in Nairobi and with the increase of flights between Nairobi and other World airports. You need to be in the airport at least an hour before your flight for check in. While the route from the city centre to the Airport through Mombasa road is a bit quicker, it occasionally gets traffic due to accidents or busy turn offs. Evenings also tend to be quite busy on the Uhuru highway stretch due to rush hour traffic and the roundabouts. 1 hour should be enough to get you to the airport with time to spare. With the airport been quite busy, securing parking might be a nightmare. So you might want to just get dropped off. Parking is charged according to length of stay at the airport. There might be some relief in parking once a new parking terminal under construction is completed. Local flights departure use Unit 3 which is currently the last unit. One may also purchase tickets at the airport, though this can be quite tricky for early morning or evening flights, especially on Friday for evening flights. Friday and weekend flights also have different rates than weekday flights - they tend to be more costly. Of course there is a mandatory security check at the entrance to the terminal, followed by flight check in. 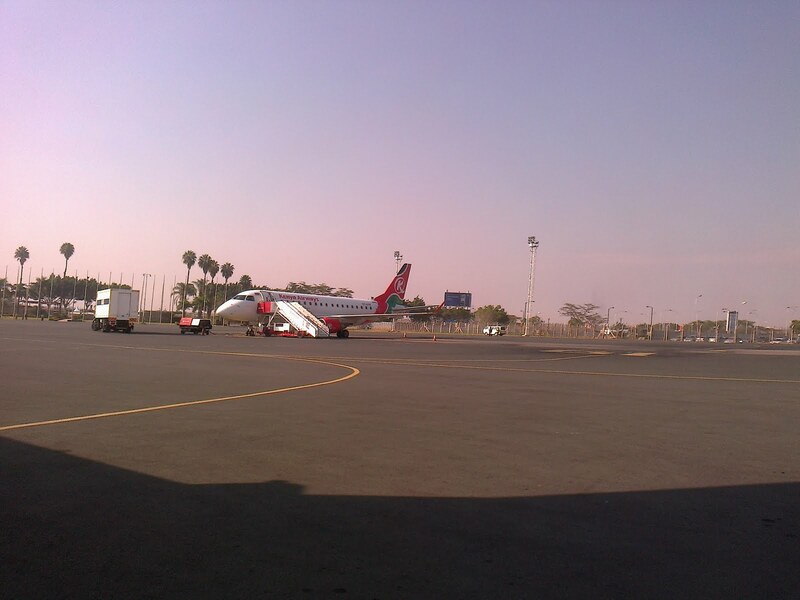 Kenya Airways has a quite spacious terminal. If you are looking to grab a quick bite before departure, there is a small restaurant in the terminal. Make sure to use it before getting into the departure terminals as they will withdraw your boarding pass. It is advisable though to eat before you get to the airport, as the prices may be a bit costly. Compared to several reports that I have heard of delayed Kenya Airway's flights, especially in Central Africa, flights to Mombasa tend to be right on time. We departed at about 9:30 am from JKIA and would be arriving at about 10.00 am in Mombasa. The flight was on a Boeing 737-300. The plane has 3 seats on 2 aisles on each side. The legroom was just sufficient for comfort. Assorted nuts - cashew and macadamia nuts - are served with a drink which can be a choice of juice, soda or water. I am not sure whether beer is served before the official hours of 5 pm on weekdays and 2 pm on weekends. The crew is quite cheerful and offer good service. It is advisable, especially for first time and non-frequent flyers to carry a packet of chewing gum. This will be needed to avoid barotrauma. Barotrauma is the scientific term for pain in the ear which will normally occur during landing and at times during take off , or mid flight on long flights. For those who did not pay much attention to their science classes, the ear consists of the outer and inner ear, while the whole ear system is linked to the nose and throat through a eustachian tube. The inner ear might trap some air, especially for people with cold or sinusitis. Aircraft are normally more pressurized than the atmosphere to enable the body to function normally at high altitudes where the pressure is low. The higher pressure will compress air, including the air trapped in the inner ear. During landing, the plane is de-pressurized and air will expand. While air trapped in the ear can easily contract and expand, ear tissues are not gifted with such capability. Expanding air will press on the ear tissues causing quite a lot of pain , which can even go down to the shoulders. Barotrauma can be avoided by yawning if it starts occurring. However, a yawn might become elusive at such times. Luckily , swallowing fluids including saliva will also help. Chewing and swallowing food stuff may help, though chewing gum while swallowing saliva offers faster relief. Chew gum during take off, you will feel pressure increasing in the ears, though this will stop and decrease as you swallow. You will feel small pops on the ear. You can stop once the plane is cruising and you are not feeling the pops. Aircraft can also de-pressurize mid-flight as the pilots change altitude. Another method to solve barotrauma is swallowing air and closing the mouth and pinching the nose. You then breathe slowly by pinching lesser. Be careful not to let all the air out in a go (breathing out hard) as this can injure the ear tissue including bursting the ear drum! A successful process will be rewarded with a slight pop. The chewing gum method is advisable though. A day flight and aisle seat are a great companion for sight seeing, though you may have to avoid it if you are afraid of flying. Seat 16 is behind the wings though, and may not offer a great view, while seat 15 is partly obstructed but still ok. The view is great starting with the aerial view of the Eastlands area, though this quickly disappears as the flight path leads straight into the drier plains of Eastern Kenya. Your geography classes will come to life. I remember spotting the so called riverine system, you could tell the path of a stream cause of the green strip that stood out of dry yellow grass. The flight was ok though there was some mild turbulence over the Mtito Andei area - the pilot attributed this to rising morning air. The view might not be that great due to the high altitude which makes things on the ground minute, and this may be due to to cloud cover. Landing at the coast is even more scenic. You are able to see the contrast in construction between the many flats of Nairobi and the low houses of the coast. There are great views at the point where rivers join the Indian ocean. One can spot the winding form of the river and the mangrove swamps. The Moi International Airport in Mombasa was opened in 1997. The airport is quite modern and spacious. The terminals themselves may be larger than the Jomo Kenyatta International Airport, with more shops, though the departure terminal is shared by all carriers. The airport parking is quite spacious. Some more travelled journalists said that the airport itself was larger than other international airports in neighbouring countries. The weather at the coast is usually quite hot and humid, though with a cool breeze. However, July appears to be the coolest month, with the night breeze turning into a strong wind at the beach that drives away revellers. The coast has a range of hotels and other related places for accommodation. Most however are geared towards tourists. Rates vary throughout the year and can be double or treble in the July - October peak season. November and December also tend to be quite busy while January - June will attract the best rates. Villas, which are structured as bungalows tend to be comfortable, more private than hotels. Villas also offer various plans from the pricier Dinner and Breakfast to the more affordable plan where you buy your own food and cook in provided kitchen. However, to cut costs, it is advisable to only pay for sleeping, and perhaps breakfast. You can find other good and affordable restaurants around your hotel. Drinks tend to be way pricey in most of the hotels. We were staying in the North Coast at Travellers Beach hotel which is more affordable than the neighbouring Sarova White Sands and doesn't compromise much on quality. However, Travellers Beach does not provide iron boxes, though does offer laundry services at an extra cost. While dinner is included with the room service, drinks including water and juice are charged separately. I found the lack of iron box odd, given other hotels such as Safari Park in Nairobi do offer iron boxes at no extra cost. While car hire and taxis are usually provided by the hotels, it may be cheaper if you get a taxi service at the towns, or if you can ask your travel agency to recommend for one. If staying at the South Coast, I would recommend Beach Dhow Villas which offer private bungalows along the beach front. These are located in Diani. You should try out various coastal restaurants in Mombasa that specialise in Swahili dishes. Tarboush (can't remember the name clearly) is one such restaurant and is located just along Makadara road, off Digo road which is off Moi Avenue. If you locate Central Police station, you will find it. Offered at Tarboush is Shawarma , Biriani amongst other swahili delicacies. The food though good is not at it's best as my colleagues commented that they have experienced better shawarma in places like Israel. Afterwards, ask for a drink called mkwaju which is made from some coastal fruit. It's bitter-sweet and a great meal companion. For meat, you can try out Cool Breeze, though they can be quite slow on week days. Their pan fried meat is quite delicious and can be ordered with Ugali. If you are looking for a quick bite, roast meat, there is a location off Nyali road (Malindi highway) , at the Bamburi turn off. After 2 round abouts, you should look out for Railway Annex choma zone, adjacent to Royal Comfort Hotel. These locations are not available on most mapping systems , though residents will be more than helpful to direct you. Coast traffic is easy, though the area around Nyali Bridge is a bottle neck and will get busy in the evenings and mornings. Getting to the airport should not be hassle, given it is located along the Nairobi highway. There are two security checks at Moi International Airport, wore unto those who have to fully undress to get through. The Airport attendants told me that the extra Security is due to Somali's proximity. The shared departure lounge has two shops, and one can grab a beer in the evenings as you wait to catch your flight. Prices vary in both shops, the one you spot first is more costly. Power ports are quite rare, if you plan on using your laptop, and there is no WiFi. Kenya Airports Authority has work on that end. Hope you enjoy your stay at the coast.